Even as the tallying of the Iowa caucuses goes late into the night, the more visually appealing race (though several of the Republican candidates are rather dashing) has already finished. Mariana Trigo Viera of Argentina's La Nacion was far and away the most tweeted #topviz. 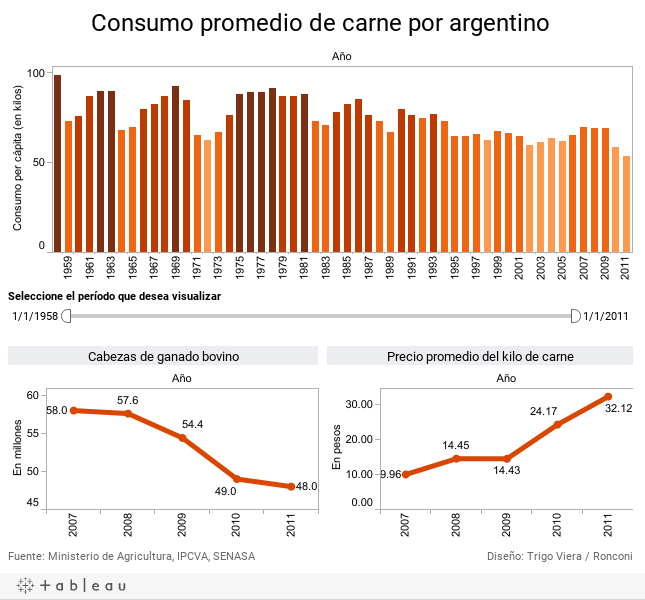 Her visualization showed the steady decline of meat consumption in Argentina in the face of rising prices. Fiona Hudson of the Herald Sun for her	Dodgy Dining viz. Ben Jones of DataRemixed for his viz Anatomy of an Outlier: Wayne Gretzky. Craig Wilson of Split Screen for his Video Game Review viz. And Zach Green of 140Elect for his viz Twitter Peaks, Polls Shift? Congrats everyone, and thanks again Tableau!